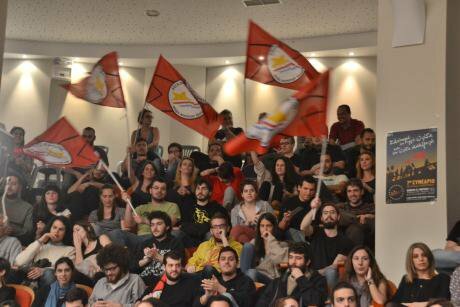 SYRIZA youth members at a conference in Athens. Demotix/Giorgos Panagakis. Some rights reserved. Greek legislative elections are due to take place on 25 January. All evidence points to a victory by the Coalition of the Radical Left party, Syriza, which before the economic crisis received 4% of the vote, but is now backed by a large part of the Greek people, especially the young. Its rise can be attributed to how the crisis was used as a means to unleash a neoliberal attack on citizens' rights, based on pre-existing divisions in society. Young people were among the first victims. As a young person myself, I am a victim of the crisis too. As architects, my parents were among the first to take a hit. The situation got even worse, as Greece entered the IMF and Memoranda period. I got into Athens Law School in 2011, at a time when an extended university reform had been voted in, that would begin the privatisation of Greek higher education. This reform would make it harder for poorer students to continue their studies, especially during this economic crisis. With the Greek state becoming more conservative under the New Democracy - PASOK government, the de facto abolition of democracy and stories of activists' torture, arbitrary police acts and immigrants' murders, I turned to Syriza. I became a member of the Organization of the Youth of Syriza, the autonomous organization of young supporters. In my view Syriza presents the best alternative to the problems young people in Greece are faced with. Young workers were the ones hit hardest by unemployment - youth unemployment is over 50%. Those 'lucky' enough to find a job, even university graduates, will work for 250-300 euros a month or even unpaid to 'gain experience' or are tied to 'voucher' programs. Young men and women remain financially dependent on their parents, cannot afford a household of their own or to start a family and are often forced to emigrate abroad. At the same time, students have seen their universities collapse. Under recent governments, free higher education stopped being entirely free, as some of the costs are transferred to students, who often cannot shoulder them. University degrees are becoming equated with those of private colleges, which teach half of the classes universities do, but have been boosted by the government. Pupils have in turn seen their free time shrink, as high schools increasingly resemble examination centres, with private tutoring thriving at the expense of knowledge and learning. For these reasons, young students and workers have in the present circumstances no option but to support the only party that takes them into account, aiming at a productive reconstruction of the country, based on them, their strengths and ideas. Syriza wants to reshape the way the Greek state functions, towards democratization and against the corruption of previous governments. It wants to provide the necessary room for self-organization initiatives and attempts at a solidaristic and cooperative economy, which we saw spring up during the crisis as a response to unemployment, misery and desperation. Besides, Syriza is the only party that lent passionate support to every movement and resistance that developed in society during these years, by actively participating in their causes and giving them a voice in parliament, while always respecting their autonomy. From the 2008 uprising after the police murder of 15-year-old Alexis Grigoropoulos, to the Greek 'indignados' movement in 2011, to the locals' resistance to the environmentally catastrophic gold mining in Chalkidiki, Syriza was there. It was there in the protests against the authoritarian closure of the country's public broadcaster and in the protests against educational reform pushed by the government. As Greece's expected next government, Syriza will seek to realise these movements' causes and offer protection to vulnerable social groups. Syriza is also alone in advocating a Europe of the people and not a Europe of austerity. The EU seems to currently only care about protecting the powerful at the expense of the working class and young people, who are forced to accept constant work with no right to free time and a decent life, fully subjected to the neoliberal dogma of individualism and competition. Only Syriza, among Greek parties, wants to move Europe towards real democracy and respect of human rights and away from a fortress-Europe with drowning immigrants in the Mediterranean, away from bigotry, islamophobia, racism and fascism. The other political parties in Greece disregard young people, some of them blatantly. Why would young voters trust the outgoing New Democracy government, which led them to cash-in-hand labour or migration? The same party that now denies them the right to vote, excluding them from the upcoming election; 18 year olds won't vote, because it is supposedly logistically impossible to add them to the electoral lists in time for the election; citizens living and working abroad won't be allowed to vote in Greek consulates around the world. Why would young people vote for PASOK, the junior partner of the governing coalition, which along with New Democracy represents the old and corrupt political establishment and which sent the country to the IMF? Why should we vote for To Potami, the party that first appeared in European elections last year? It claims to bring new ideas to the table and targets young people, but in reality is funded by and consists of the corrupt political establishment and aligns itself with the neoliberal bloc. Young people have no reason to support any of these parties, who are responsible for having destroyed their lives, whose sole concern is to implement the European elites' and markets' inhumane orders, only selectively altering them to suit their own and their political clientele. Because the crisis doesn't only deprive us of our dreams, but also affects us in our everyday lives, seeing our parents' desperation, who after years of work don't know if they'll be able to pay the bills the next day. Faced with this social collapse and desperation, young people shouldn't give in to inaction and misery by abstaining from the election. Equating all political parties without having tried a different alternative is the wrong mentality. On the contrary we need to seize the opportunity to back a party that wants to give us a platform to participate in decision-making. Nor should we succumb to violent reaction, as expressed by the neo-Nazi Golden Dawn, which advertises itself as an anti-system party in order to attract the indignant youth, but at the same time backs the government's selling off of public property. A Syriza victory, on the other hand, can give back hope both to the youth and to broader society. It can give us the hope which will enable us to raise our voices and actively take part in the country's political life, from the local level to the unions, from the workplace to the universities. Syriza can give us back what the previous governments systematically denied us: the ability to fight for our dreams. Thanks to Yannis Paradeisiadis for the translation.